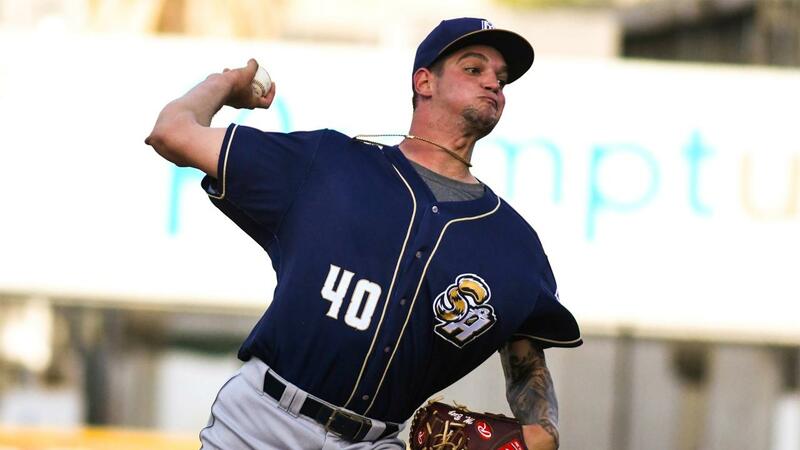 A couple of big hits by Josh Rojas and a dominant outing from left-hander Ryan Hartman sparked Corpus Christi to a 7-0 win over San Antonio in Game 1 of the Texas League South Division Series Wednesday night at Whataburger Field. Michel Baez drew the Game 1 assignment for the Missions. The No. 7 prospect in the San Diego system (MLB.com) entered Wednesday's playoff showdown with just four Double-A starts under his belt. Fortunately, for San Antonio, Baez showed no signs of nerves early on. The 22-year-old hurler overcame a walk to leadoff man Ronnie Dawson in the first by striking out a pair. Strikeouts would be the theme of Game 1 as Baez proceeded to punch out two more in a scoreless second. However, in the third, the right-hander caught a tough break. With two outs, Dawson kept the inning alive with a single. After Stephen Wrenn continued the frame with a single of his own, Rojas lifted a ball into shallow left. At first, the fly ball looked to be the final out of the inning. But to the chagrin of Baez, it fell in between left fielder Josh Naylor and shortstop Owen Miller for a double, scoring both runners. Baez shook off the blooper to put up zeroes in both the fourth and the fifth, adding three more strikeouts. Corpus Christi would chase Baez (0-1) in the sixth when Rojas followed a Wrenn walk with a double to left that pushed the Hooks lead to 3-0. Newcomer Roland Bolanos replaced Baez and promptly allowed Taylor Jones to increase the deficit to four with a single to right center. Corpus Christi broke the game open against Bolanos in the seventh on a bizarre single that scored three runs thanks to a pair of San Antonio errors on the play. The 7-0 lead was more than enough for Hartman, who showed his Texas League All-Star form all night. After working around one-out singles in both the first and second innings, Hartman proceeded to go on a run in which he retired 15 straight Missions. Hartman (1-0) allowed just three hits and no walks in his seven and two-thirds innings, while punching out seven. The lefty threw 71 of his 96 pitches for strikes. The TLDS resumes from Whataburger Field Thursday with Game 2 at 6:35 PM. Emmanuel Ramirez (2-2, 2.63) will get the ball for the Missions, while the Hooks counter with fellow righty Corbin Martin (7-2, 2.97). Notes: In addition to Bolanos and Miller, San Antonio also added pitchers David Bednar, Nick Margevicius and Dauris Valdez before the series opener. All arrived from High-A Lake Elsinore except Miller, who joined the club from Class A Fort Wayne.